Is anyone else cold today? I swear it is crazy how cold I have been. 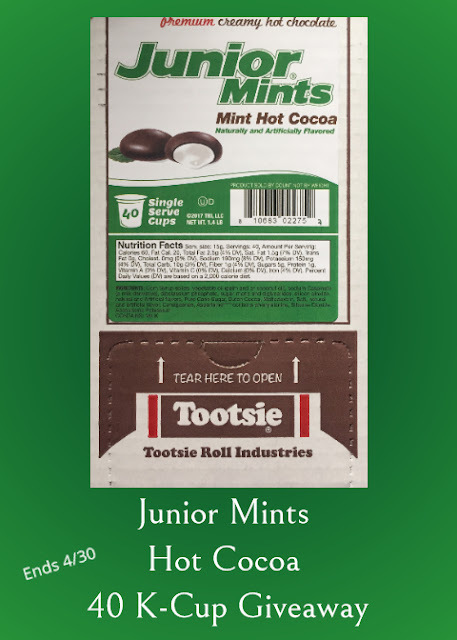 26 when I woke this morning on April 9th but now we can warm up on a cool day with the Junior Mints Mint Flavored Hot Cocoa. This smooth, delicious dark hot chocolate has a smooth peppermint flavor that will remind you of a Junior Mint candy. Pure cane sugar, non dairy creamer (corn syrups solids, hydrogenated coconut oil, sodium caseinate (a milk derivative), dipotassium phosphate, mono- and diglycerides, salt, sodium citrate, sodium silicoaluminate, soy lecithin, artificial flavours, artificial colours), maltodextrin, cocoa and artificial flavours, salt silicone dioxide. Contains: Aspartame, Milk, manufactured in a plant that processes soy. I brought some to work today against my dear daughter's wishes and my co-workers loved them. When I left today, those who were on lunch were sitting around with their piping hot cocoas all telling me how good it was. BTW...I have a Keurig 2.0 and this worked perfectly but we only do 8 oz. We found the 10 oz was watery. Unless you like your hot cocoa watery. We prefer creamy. If you love hot chocolate you will love Junior Mints Hot Cocoa. I love it with milk. I like my hot cocoa with milk. I love hot cocoa with milk, but usually make it with water. I usually drink my cocoa with water. I think I like my hot cocoa better with milk,I think it give it a richer creamier taste. I prefer my Hot Cocoa with milk. Like hot cocoa with milk. I make my hot chocolate with milk. I'm usually just a plain hot water & cocoa kind of girl! I love Keurig cocoas! I usually just add water. Milk if it’s super cold outside.